President Donald Trump on Tuesday stopped short of officially declaring the opioid addiction epidemic a public health emergency, going against recommendations set forth by his own special task force commissioned to find solutions to the crisis. Instead, the president during a short briefing in Bridgewater, N.J., raised the specter of pursuing a tougher law enforcement strategy to tackle a crisis that claimed 52,000 lives in 2015. Trump cited his desire to accelerate the rate of federal drug prosecutions and suggested that sentencing guidelines also need to be strengthened. The president did not offer specifics on how he would work the public health sector. "The best way to prevent drug addiction and overdose is to prevent people from abusing drugs in the first place," he said. "If they don't start, they won't have a problem. If they do start, it's awfully tough to get off. So we can keep them from going on, and maybe by talking to youth and telling them, 'No good; really bad for you' in every way. But if they don't start, it will never be a problem." Advocates expressed disappointment at the administration's decision not to make the emergency declaration. They contended the epidemic's impact warrants a federal response much in the same manner as those that occur after a natural disaster or infectious disease outbreak. 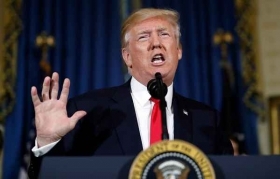 "I think he should declare a national emergency, not just because that would be a symbolic gesture, but it would actually be very helpful depending on how he utilized that authority," said Dr. Andrew Kolodny, co-director of opioid policy research at Brandeis University. Kolodny said a public health emergency declaration has the potential to immediately make millions in emergency funding and resources available to states battling the crisis. It also would exempt providers from complying with some federal regulations, giving them greater flexibility to treat addicted patients. The president's Commission on Combating Drug Addiction and the Opioid Crisis las week called for Trump to declare the opioid crisis a national emergency in light of the ongoing rise in the number of overdose deaths related to the use of prescription pain relievers, heroin and illegal synthetic opioids such as fentanyl. But HHS Secretary Dr. Tom Price, who told reporters Tuesday that this will be "treated like an emergency," argued the federal government already has all of the resources it needs at its disposal, adding that the agency is working on a comprehensive strategy that will be delivered to the president "in the near future." But for those on the front lines, Trump's announcement amounted to just more rhetoric. "Talking about the issue as an epidemic alone is not enough," said Dr. Leana Wen, Baltimore city health commissioner. "What's frustrating for us is that we know what works—the science is there—we need much more funding to address this epidemic."